The Five hundred meter Aperture Spherical Telescope (FAST) in Guizhou Province, China will be the world’s largest single dish radio telescope when completed in September 2016. FAST will revolutionize radio astronomy in the band from 70 MHz to 3 GHz. A good telescope needs good science objectives and operation plans. With first light of the FAST telescope rapidly approaching, the National Astronomical Observatories of China (NAOC) and Guizhou Normal University organized the "Frontiers in Radio Astronomy (FRA) 2015" symposium to discuss the early science programs and operational planning for FAST. This is the 2nd FRA symposium; the first one was held in 2012. More than 100 astronomers from around the world working in radio astronomy and other related fields attended this meeting. Topics discussed included pulsars, star formation, evolved stars, cosmology, and past, current, and future radio instrumentation. 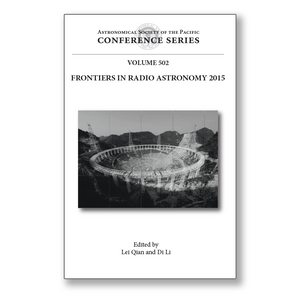 This volume will be of interest to astronomers and engineers interested in FAST and the impact it will have on radio astronomy around the world.